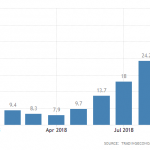 Photo Credit-tradingeconomics.com: The annual inflation rate in Iran has increased to 36.9 percent in October of 2018. New findings from the Iranian Statistical Center indicate that inflation is up 34.9% from last year’s levels. Between October 23rd and November 22nd, the average family had to spend 34.9% more than they did last year to buy the same goods. This also represents an increase in last month’s inflation rate, which was 32.8%. International observers and the International Monetary Fund (IMF) predict that Iran’s rate of inflation will increase by a staggering 40% next year. They both also predicted a sharp increase in unemployment by 13% or 14%. The predictions align with the People’s Mujahedin Organisation of Iran’s (MEK’s) own reporting, which predicted a “tsunami of poverty” to strike Iran in the latter part of 2018. The IMF estimates that Iran’s economy will shrink by around 1.5% at the end of 2018, and by 3.6% in 2019. However, the reality could be far worse. The IMF basis its predictions on government figures, many of which are deliberately manipulated to hide the full extent of Iran’s economic woes. Steve Hanke, an economist at Johns Hopkins University has called the economic situation in Iran, one “of the worst government-induced inflationary regimes in the world”. Hanke estimates that only Venezuela suffers from a higher rate of inflation. The economic situation in Iran has gotten so bad that many Labor activists estimate that most workers can only provide 50% of their families’ basic needs. The mullahs and their clerical regime have demonstrated virtually no economic acumen or experience. They have not implemented a single economic policy designed to lift Iran’s economic standing. The mullahs’ only response to the deepening poverty gripping the country has been to offer “support packages”. These packages are small cash boosters provided to people who earn less than 3 million toumans. Given the surging inflation rate, even with these meager offerings, most workers are fighting for their survival. Alireza Fathi, a board member for the Tehran Islamic Council of Workers said, “workers have been abandoned until the point of an [economic] earthquake when they are forgotten forever”. There have been reports of many of Iran’s workers resorting to extreme measures when faced with financial ruin. In some regions, workers have sold organs to keep a roof over their heads. Elsewhere, workers are committing suicide due to the stresses induced by living in abstract poverty. According to a state-run news site, suicides are up by 71% in men and 66% in women on last years figures. Amin Montazeri, the head of the Crisis Committee of the Labor Council said, “many show their reaction by attempting suicide or lashing out against others”. Drug addiction rates in Iran are also rising alongside the country’s inflation rate as workers turn to narcotics to escape the realities of their existence. Part of the regime’s inability to address Iran’s spiraling economic problems stems from its inability to acknowledge the severity of the situation. The Iranian Statistical Center’s findings now prove beyond any doubt that the mullahs’ claims of keeping inflation under control are blatantly false. Fathi said, “not only is there no policy to control prices, but also the head of state clearly states that we have no problems”. Without admitting there is a problem, the regime is condemned to inaction and Iran’s economy is doomed.